The Sangoma FreePBX Phone System 100 is licensed for up to 100 users allowing for a total of 30 simultaneous calls. This powerful hardware has a Intel Celeron Quad core processor with 250GB SSD storage and 4GB of RAM. There are 2 PCI express slots on the appliance which allow users to add any telephony cards from Sangoma's range for PSTN connectivity. 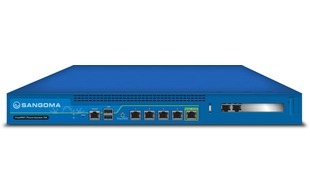 Sangoma's FreePBX systems have a wide set of advance telephony features that are included as standard, for example call recording and call reporting. There is also a range of add-on modules available designed to further enhance your VoIP communications experience. Free online support is available from the official FreePBX IRC channel or the community supported forums. Or for direct support, ad-hoc support tickets and assistance is available from Sangoma's experts and can be purchase from the FreePBX website.